Hollybeary Creations : NND April Release Day 4! NND April Release Day 4! Happy Thursday!! It's Day 4 of the Newton's Nook April Release and that means all of the products will be available in the store tomorrow... Yay!! Today we are sharing the newest Newton inspired set.. Newton's Birdbath and it's coordinating die. This is such a cute set and I love the scenes you could create with all the little images. I created a White top folding card base and then I added some rainbow paper that I die cut with a Large stitched rectangle die. Then I die cut two pieces of patter papers that had a faux watercolor look using another stitched die and layered them together. I stamped the sentiment into the lower corner and adhered that piece to the card front with some foam adhesive. 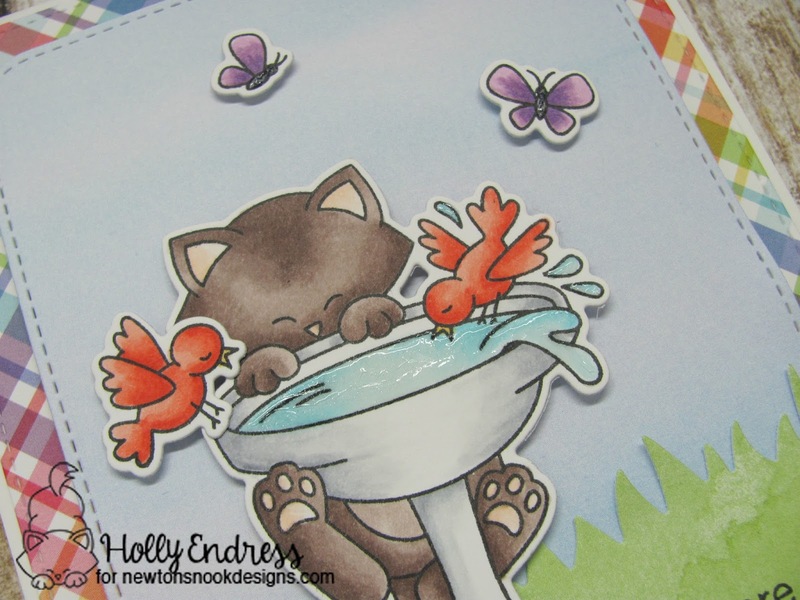 Would you like to win the “Newton's Birdbath” Stamp Set? Super fun cute and absolutely adorable! Love the pattern paper you used!!! Love your take on this stamp set! Really cute. Love this stamp set. This is so delightful in design & colors. Love how the water looks so real. Love the design of this card and how you colored in Newton! Love the coloring, what a great card! So adorable! I love the colors you used and the fun plaid background! Perfect for a spring greeting! Very pretty, like the plaid background. Your card is adorable!!! Love the colors. Adorable! Love finding new stamp lines I never knew existed! Great coloring job, too! card - lots of depth. Very cute card! I love the rainbow plaid paper, it made such a fun background for Newton and his birdie friends! I love how you made the water glossy! Such a cute springy card! So cute. Thanks for the inspiration! Adorable card!! Your card is so cheerful it makes me smile. Beautiful coloring too. Darling card! Love the way you colored Newton! Cute birds and butterflies too! So cute! I love that you paired with plaids. So spring! Very fun and colorful scene with Newton! Absolutely adorable! I love the glossy water! Our cats love water! So cute. I like your coloring and the plaid paper. Love the background paper you chose. Really makes the cat pop off the page (not to mention the dimensional tape). What a beautiful card---love the colors you've used!